As homeschoolers, the Duggars are always up for an educational field trip. One of their most recent excursions was to the Arkansas Treasury. is Anna pregnant?!?!??!??!?!?!?! my apologies if she is not.. but that would be AWESOME if she was!!!!!!!!!! I agree be awesome if she is,hope they make an announcement on the new season. Nice pictures, but how current are they? Anna looks sooo pregnant :-) Or did I miss an announcement? Is Anna pregnant? It sure looks like it. And what a fun field trip that must have been! Is Anna expecting??? I hope so, Josh and Anna are great parents!! Looks like Anna is pregnant. Wonder if they will time the announcement with the start of the new season! same here. looks like Anna is preggo! The photos were taken this week. As for Anna being pregnant, nothing has been announced, but rest assured that if anything happens, we will post about it right away. Do you know that Anna is pregnant but you are just not saying it because you don't have the liberty? If you are such close friend of course you know. Just say that you know but can't tell. That would be honest too. Nothing has been announced to whom: The Today Show? They have announced to friends and family. 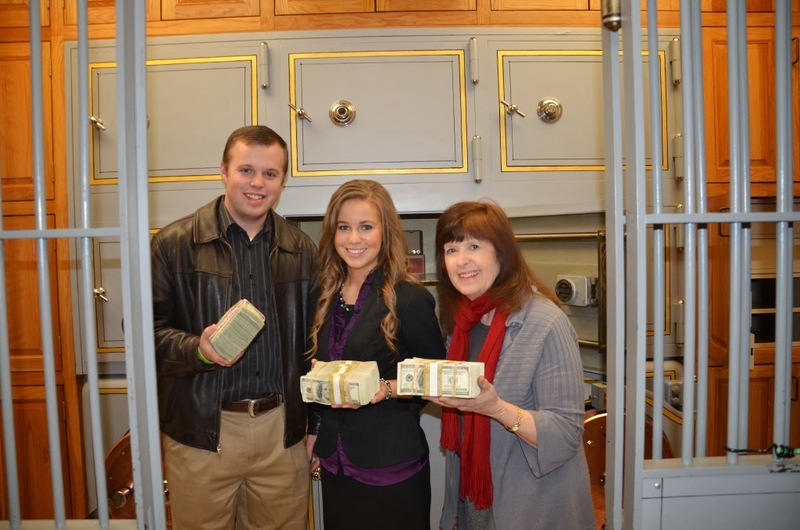 I believe these pictures were taken from the Arkansas treasury's website and not Josh's website therefore the Duggars never expected them to be seen by others.So it looks like she might be pregnant and didn't bother to hide it for the photo opp since she didn't expect it to be publicized. Anna is so-o-o pregnant, no question! I mean, there is no way she would look like this even if she was just overweight. Maybe they did not make an announcement waiting for the new season. Or maybe after Michelle's miscarriage last year they are overprotective and want to make sure that the pregnancy is ok. Congratulations anyway!! Oh Anna looks pregnant ! OMG SO HAPPY FOR HER ! IS anna pregnant ??? i think she is ! I believe these pictures were taken from the Arkansas treasury's website not from Josh's website. So I don't think the Duggars expected them to be publicized and that would explain why Anna is not hiding an apparently pregnant belly. Anna definitely looks pregnant! I bet there will be an announcement soon! Seems like another M-named baby is coming soon! Congratulations! There is no reason not to post the comment that I have made twice regarding why this photograph is not hiding an apparently pregnant Anna. It is neither profane, derogatory nor is it in poor taste. Anna has got to be prego!!! Im not one to usually say anna looks pregnant.....but she does!!!!! More than ever! Im sure when the new season starts they will be on Today Show. Anna lookes pregnant that would be so amazing for them ! Is that real money that they are holding? Aww I cant believe another little one is on the way!! Congrats Josh and Anna!! There is no way Anna isn't pregnant! She is TOTALLY going to have baby number three very soon! So strange that the Duggars have chosen to keep it a secret. Congrats to Josh and Anna! I wonder what Michael is going to think of the new addition? All the Duggar children pictured and Grandma Duggar appear to be doing wonderfully well and happy. Looking forward to new episodes this spring to hear of their adventures since last season. Oh Anna is so pregnant!!!! I mean if she was not why would she be wearing a maternity shirt?! I agree, Anna does look like she's expecting again, but remember how everyone here was saying that a year ago . . . and she wasn't??? I don't know if she's nursing Michael still, but that can make it harder to lose the baby weight. It could just be the styles she's wearing, too. What in your life is missing from you knowing / not knowing if Anna Duggar is pregnant or not??? It's her 3rd (assuming she's pg, thus the maternity top), so she may not be as far along as 4-5 months. You pop out faster with subsequent pregnancies. I'm excited for them, if indeed she's pg. I thought I saw that Anna had a miscarriage last year, so that would explain why she looked pregnant last year as well. She definitely looks like it now! She looks radiantly beautiful! Maybe due in April or May. My God Bless Josh and Anna either way! 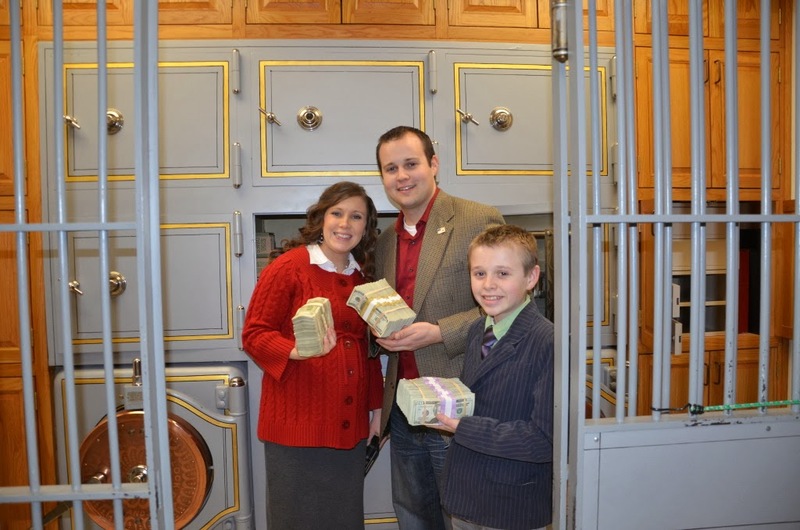 Yes, the money that the Duggars are holding is real. Until the Duggars confirm Anna's pregnancy, which they have not done, it is only a rumor. If/when an announcement is made, we will post about it right away. The pregnancy has not been confirmed by the Duggars, and until it is, it is still just a rumor. It is our policy not to make a big announcement like that until the Duggars wish to make it official. I think Anna looks pregnant, too. I just saw a commercial for the new season coming up where the Duggars go to Asia and she flushes a toilet with her foot and the camera pans down to her foot and her tummy definitely looks like it's got a baby bump! Maybe the reason she didn't announce it on The Today Show yet is because she did have a miscarriage before she got pregnant with Michael and she's just being more careful about announcing it too soon now. I've had 5 miscarriages, so I can definitely understand that! I waited until I was 12 weeks along with the one I'm pregnant with now (I'm 19 weeks and 5 days! Yay!) before I even told my own parents that my hubby and I were expecting! She is pregnant. We met the family in November & she was newly expecting. They will be on the Today show on Monday. Kind of a bust when it's already leaked. Wonder why they feel the need to make an announcement on national tv?